An endospore is a dormant, tough, and non-reproductive structure produced by certain bacteria from the phylum Firmicutes. The name "endospore" is suggestive of a spore or seed-like form, but it is not a true spore. It is a stripped-down, dormant form to which the bacterium can reduce itself. Endospore formation is usually triggered by a lack of nutrients, and usually occurs in gram-positive bacteria. In endospore formation, the bacterium divides within its cell wall, and one side then engulfs the other. Endospores enable bacteria to lie dormant for extended periods, even centuries. There are many reports of spores remaining viable over 10,000 years, and revival of spores millions of years old has been claimed. There is one report of viable spores of Bacillus marismortui in salt crystals approximately 250 million years old. When the environment becomes more favorable, the endospore can reactivate itself to the vegetative state. Most types of bacteria cannot change to the endospore form. Examples of bacteria that can form endospores include Bacillus and Clostridium. Levofloxacin, sold under the trade names Levaquin among others, is an antibiotic. It is used to treat a number of bacterial infections including acute bacterial sinusitis, pneumonia, urinary tract infections, chronic prostatitis, and some types of gastroenteritis. Along with other antibiotics it may be used to treat tuberculosis, meningitis, or pelvic inflammatory disease. Use is generally only recommended when other options are not available. It is available by mouth, intravenously, and in eye drop form. Cutaneous anthrax, also known as hide-porter's disease, is when anthrax occurs on the skin. It is the most common form (>90% of anthrax cases). It is also the least dangerous form (low mortality with treatment, 20% mortality without). 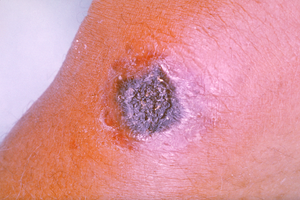 Cutaneous anthrax presents as a boil-like skin lesion that eventually forms an ulcer with a black center (eschar). The black eschar often shows up as a large, painless, necrotic ulcer (beginning as an irritating and itchy skin lesion or blister that is dark and usually concentrated as a black dot, somewhat resembling bread mold) at the site of infection. In general, cutaneous infections form within the site of spore penetration between two and five days after exposure. Unlike bruises or most other lesions, cutaneous anthrax infections normally do not cause pain. Nearby lymph nodes may become infected, reddened, swollen, and painful. A scab forms over the lesion soon, and falls off in a few weeks. Complete recovery may take longer. Cutaneous anthrax is typically caused when B. anthracis spores enter through cuts on the skin. This form is found most commonly when humans handle infected animals and/or animal products. Cutaneous anthrax is rarely fatal if treated,  because the infection area is limited to the skin, preventing the lethal factor, edema factor, and protective antigen from entering and destroying a vital organ. Without treatment, about 20% of cutaneous skin infection cases progress to toxemia and death. Anthrax lethal factor endopeptidase is an enzyme that catalyzes the hydrolysis of mitogen-activated protein kinase kinases. This enzyme is a component of the lethal factor produced by the bacterium Bacillus anthracis. The preferred cleavage site can be denoted by BBBBxHxH, in which B denotes a basic amino acid Arg or Lys, H denotes a hydrophobic amino acid, and x is any amino acid. Gastrointestinal (GI) infection is most often caused by consuming anthrax-infected meat and is characterized by diarrhea, potentially with blood, abdominal pains, acute inflammation of the intestinal tract, and loss of appetite. Occasional vomiting of blood can occur. Lesions have been found in the intestines and in the mouth and throat. After the bacterium invades the gastrointestinal system, it spreads to the bloodstream and throughout the body, while continuing to make toxins. GI infections can be treated, but usually result in fatality rates of 25% to 60%, depending upon how soon treatment commences. This form of anthrax is the rarest. Bacillus anthracis is a rod-shaped, Gram-positive, aerobic bacterium about 1 by 9 μm in size. It was shown to cause disease by Robert Koch in 1876 when he took a blood sample from an infected cow, isolated the bacteria, and put them into a mouse. The bacterium normally rests in spore form in the soil, and can survive for decades in this state. Herbivores are often infected whilst grazing, especially when eating rough, irritant, or spiky vegetation; the vegetation has been hypothesized to cause wounds within the GI tract, permitting entry of the bacterial spores into the tissues, though this has not been proven. Once ingested or placed in an open wound, the bacteria begin multiplying inside the animal or human and typically kill the host within a few days or weeks. The spores germinate at the site of entry into the tissues and then spread by the circulation to the lymphatics, where the bacteria multiply. The production of two powerful exotoxins and lethal toxin by the bacteria causes death. Veterinarians can often tell a possible anthrax-induced death by its sudden occurrence, and by the dark, nonclotting blood that oozes from the body orifices. Most anthrax bacteria inside the body after death are outcompeted and destroyed by anaerobic bacteria within minutes to hours post mortem. However, anthrax vegetative bacteria that escape the body via oozing blood or through the opening of the carcass may form hardy spores. These vegetative bacteria are not contagious. One spore forms per one vegetative bacterium. The triggers for spore formation are not yet known, though oxygen tension and lack of nutrients may play roles. Once formed, these spores are very hard to eradicate. The infection of herbivores (and occasionally humans) by the inhalational route normally proceeds as: Once the spores are inhaled, they are transported through the air passages into the tiny air sacs (alveoli) in the lungs. The spores are then picked up by scavenger cells (macrophages) in the lungs and are transported through small vessels (lymphatics) to the lymph nodes in the central chest cavity (mediastinum). Damage caused by the anthrax spores and bacilli to the central chest cavity can cause chest pain and difficulty in breathing. Once in the lymph nodes, the spores germinate into active bacilli that multiply and eventually burst the macrophages, releasing many more bacilli into the bloodstream to be transferred to the entire body. Once in the blood stream, these bacilli release three proteins named lethal factor, edema factor, and protective antigen. The three are not toxic by themselves, but their combination is incredibly lethal to humans. Protective antigen combines with these other two factors to form lethal toxin and edema toxin, respectively. These toxins are the primary agents of tissue destruction, bleeding, and death of the host. If antibiotics are administered too late, even if the antibiotics eradicate the bacteria, some hosts still die of toxemia because the toxins produced by the bacilli remain in their systems at lethal dose levels. Occupational exposure to infected animals or their products (such as skin, wool, and meat) is the usual pathway of exposure for humans. Workers who are exposed to dead animals and animal products are at the highest risk, especially in countries where anthrax is more common. Anthrax in livestock grazing on open range where they mix with wild animals still occasionally occurs in the United States and elsewhere. Many workers who deal with wool and animal hides are routinely exposed to low levels of anthrax spores, but most exposure levels are not sufficient to develop anthrax infections. A lethal infection is reported to result from inhalation of about 10,000–20,000 spores, though this dose varies among host species. Little documented evidence is available to verify the exact or average number of spores needed for infection. The lethality of the anthrax disease is due to the bacterium's two principal virulence factors: the poly-D-glutamic acid capsule, which protects the bacterium from phagocytosis by host neutrophils, and the tripartite protein toxin, called anthrax toxin. Anthrax toxin is a mixture of three protein components: protective antigen (PA), edema factor (EF), and lethal factor (LF). PA plus LF produces lethal toxin, and PA plus EF produces edema toxin. These toxins cause death and tissue swelling (edema), respectively. To enter the cells, the edema and lethal factors use another protein produced by B. anthracis called protective antigen, which binds to two surface receptors on the host cell. A cell protease then cleaves PA into two fragments: PA20 and PA63. PA20 dissociates into the extracellular medium, playing no further role in the toxic cycle. PA63 then oligomerizes with six other PA63 fragments forming a heptameric ring-shaped structure named a prepore. Once in this shape, the complex can competitively bind up to three EFs or LFs, forming a resistant complex. Receptor-mediated endocytosis occurs next, providing the newly formed toxic complex access to the interior of the host cell. The acidified environment within the endosome triggers the heptamer to release the LF and/or EF into the cytosol. It is unknown how exactly the complex results in the death of the cell. Edema factor is a calmodulin-dependent adenylate cyclase. Adenylate cyclase catalyzes the conversion of ATP into cyclic AMP (cAMP) and pyrophosphate. The complexation of adenylate cyclase with calmodulin removes calmodulin from stimulating calcium-triggered signaling, thus inhibiting the immune response. To be specific, LF inactivates neutrophils (a type of phagocytic cell) by the process just described so they cannot phagocytose bacteria. Throughout history, lethal factor was presumed to cause macrophages to make TNF-alpha and interleukin 1, beta (IL1B). TNF-alpha is a cytokine whose primary role is to regulate immune cells, as well as to induce inflammation and apoptosis or programmed cell death. Interleukin 1, beta is another cytokine that also regulates inflammation and apoptosis. The overproduction of TNF-alpha and IL1B ultimately leads to septic shock and death. However, recent evidence indicates anthrax also targets endothelial cells that line serous cavities such as the pericardial cavity, pleural cavity, and peritoneal cavity, lymph vessels, and blood vessels, causing vascular leakage of fluid and cells, and ultimately hypovolemic shock and septic shock. All Bacillus species grow well on 5% sheep blood agar and other routine culture media. Polymyxin-lysozyme-EDTA-thallous acetate can be used to isolate B. anthracis from contaminated specimens, and bicarbonate agar is used as an identification method to induce capsule formation. Bacillus spp. usually grow within 24 hours of incubation at 35 °C, in ambient air (room temperature) or in 5% CO2. If bicarbonate agar is used for identification, then the medium must be incubated in 5% CO2. B. anthracis colonies are medium-large, gray, flat, and irregular with swirling projections, often referred to as having a "medusa head" appearance, and are not hemolytic on 5% sheep blood agar. The bacteria are not motile, susceptible to penicillin, and produce a wide zone of lecithinase on egg yolk agar. Confirmatory testing to identify B. anthracis includes gamma bacteriophage testing, indirect hemagglutination, and enzyme-linked immunosorbent assay to detect antibodies. The best confirmatory precipitation test for anthrax is the Ascoli test. If a person is suspected as having died from anthrax, precautions should be taken to avoid skin contact with the potentially contaminated body and fluids exuded through natural body openings. The body should be put in strict quarantine. A blood sample should then be collected and sealed in a container and analyzed in an approved laboratory to ascertain if anthrax is the cause of death. Then, the body should be incinerated. Microscopic visualization of the encapsulated bacilli, usually in very large numbers, in a blood smear stained with polychrome methylene blue (McFadyean stain) is fully diagnostic, though culture of the organism is still the gold standard for diagnosis. Full isolation of the body is important to prevent possible contamination of others. Protective, impermeable clothing and equipment such as rubber gloves, rubber apron, and rubber boots with no perforations should be used when handling the body. No skin, especially if it has any wounds or scratches, should be exposed. Disposable personal protective equipment is preferable, but if not available, decontamination can be achieved by autoclaving. Disposable personal protective equipment and filters should be autoclaved, and/or burned and buried. Anyone working with anthrax in a suspected or confirmed person should wear respiratory equipment capable of filtering particles of their size or smaller. The US National Institute for Occupational Safety and Health – and Mine Safety and Health Administration-approved high-efficiency respirator, such as a half-face disposable respirator with a high-efficiency particulate air filter, is recommended. All possibly contaminated bedding or clothing should be isolated in double plastic bags and treated as possible biohazard waste. The body of an infected person should be sealed in an airtight body bag. Dead people who are opened and not burned provide an ideal source of anthrax spores. Cremating people is the preferred way of handling body disposal. No embalming or autopsy should be attempted without a fully equipped biohazard laboratory and trained, knowledgeable personnel. Vaccines against anthrax for use in livestock and humans have had a prominent place in the history of medicine. The French scientist Louis Pasteur developed the first effective vaccine in 1881. Human anthrax vaccines were developed by the Soviet Union in the late 1930s and in the US and UK in the 1950s. The current FDA-approved US vaccine was formulated in the 1960s. Preventive antibiotics are recommended in those who have been exposed. Early detection of sources of anthrax infection can allow preventive measures to be taken. In response to the anthrax attacks of October 2001, the United States Postal Service (USPS) installed biodetection systems (BDSs) in their large-scale mail processing facilities. BDS response plans were formulated by the USPS in conjunction with local responders including fire, police, hospitals, and public health. Employees of these facilities have been educated about anthrax, response actions, and prophylactic medication. Because of the time delay inherent in getting final verification that anthrax has been used, prophylactic antibiotic treatment of possibly exposed personnel must be started as soon as possible. Anthrax cannot be spread directly from person to person, but a person's clothing and body may be contaminated with anthrax spores. Effective decontamination of people can be accomplished by a thorough wash-down with antimicrobial soap and water. Waste water should be treated with bleach or another antimicrobial agent. Effective decontamination of articles can be accomplished by boiling them in water for 30 minutes or longer. Chlorine bleach is ineffective in destroying spores and vegetative cells on surfaces, though formaldehyde is effective. Burning clothing is very effective in destroying spores. After decontamination, there is no need to immunize, treat, or isolate contacts of persons ill with anthrax unless they were also exposed to the same source of infection. Robert Koch, a German physician and scientist, first identified the bacterium that caused the anthrax disease in 1875 in Wolsztyn (now part of Poland). His pioneering work in the late 19th century was one of the first demonstrations that diseases could be caused by microbes. In a groundbreaking series of experiments, he uncovered the lifecycle and means of transmission of anthrax. His experiments not only helped create an understanding of anthrax, but also helped elucidate the role of microbes in causing illness at a time when debates still took place over spontaneous generation versus cell theory. Koch went on to study the mechanisms of other diseases and won the 1905 Nobel Prize in Physiology or Medicine for his discovery of the bacterium causing tuberculosis. Although Koch arguably made the greatest theoretical contribution to understanding anthrax, other researchers were more concerned with the practical questions of how to prevent the disease. In Britain, where anthrax affected workers in the wool, worsted, hides, and tanning industries, it was viewed with fear. John Henry Bell, a doctor based in Bradford, first made the link between the mysterious and deadly "woolsorter's disease" and anthrax, showing in 1878 that they were one and the same. In the early 20th century, Friederich Wilhelm Eurich, the German bacteriologist who settled in Bradford with his family as a child, carried out important research for the local Anthrax Investigation Board. Eurich also made valuable contributions to a Home Office Departmental Committee of Inquiry, established in 1913 to address the continuing problem of industrial anthrax. His work in this capacity, much of it collaboration with the factory inspector G. Elmhirst Duckering, led directly to the Anthrax Prevention Act (1919). Nonetheless, the Vollum strain, developed but never used as a biological weapon during the Second World War, is much more dangerous. The Vollum (also incorrectly referred to as Vellum) strain was isolated in 1935 from a cow in Oxfordshire. This same strain was used during the Gruinard bioweapons trials. A variation of Vollum, known as "Vollum 1B", was used during the 1960s in the US and UK bioweapon programs. Vollum 1B is widely believed  to have been isolated from William A. Boyles, a 46-year-old scientist at the US Army Biological Warfare Laboratories at Camp (later Fort) Detrick, Maryland, who died in 1951 after being accidentally infected with the Vollum strain. Chlorine dioxide has emerged as the preferred biocide against anthrax-contaminated sites, having been employed in the treatment of numerous government buildings over the past decade. Its chief drawback is the need for in situ processes to have the reactant on demand. Using the catalyst method, a complete destruction of all anthrax spores can be achieved in under 30 minutes. A standard catalyst-free spray destroys fewer than half the spores in the same amount of time. Cleanup of anthrax-contaminated areas on ranches and in the wild is much more problematic. Carcasses may be burned,  though often 3 days are needed to burn a large carcass and this is not feasible in areas with little wood. Carcasses may also be buried, though the burying of large animals deeply enough to prevent resurfacing of spores requires much manpower and expensive tools. Carcasses have been soaked in formaldehyde to kill spores, though this has environmental contamination issues. Block burning of vegetation in large areas enclosing an anthrax outbreak has been tried; this, while environmentally destructive, causes healthy animals to move away from an area with carcasses in search of fresh grass. Some wildlife workers have experimented with covering fresh anthrax carcasses with shadecloth and heavy objects. This prevents some scavengers from opening the carcasses, thus allowing the putrefactive bacteria within the carcass to kill the vegetative B. anthracis cells and preventing sporulation. This method also has drawbacks, as scavengers such as hyenas are capable of infiltrating almost any exclosure. The experimental site at Gruinard Island is said to have been decontaminated with a mixture of formaldehyde and seawater by the Ministry of Defence. It is not clear whether similar treatments had been applied to US test sites. Anthrax spores have been used as a biological warfare weapon. Its first modern incidence occurred when Nordic rebels, supplied by the German General Staff, used anthrax with unknown results against the Imperial Russian Army in Finland in 1916. Anthrax was first tested as a biological warfare agent by Unit 731 of the Japanese Kwantung Army in Manchuria during the 1930s; some of this testing involved intentional infection of prisoners of war, thousands of whom died. Anthrax, designated at the time as Agent N, was also investigated by the Allies in the 1940s. A long history of practical bioweapons research exists in this area. For example, in 1942, British bioweapons trials severely contaminated Gruinard Island in Scotland with anthrax spores of the Vollum-14578 strain, making it a no-go area until it was decontaminated in 1990. The Gruinard trials involved testing the effectiveness of a submunition of an "N-bomb" – a biological weapon containing dried anthrax spores. Additionally, five million "cattle cakes" (animal feed pellets impregnated with anthrax spores) were prepared and stored at Porton Down for "Operation Vegetarian" – antilivestock attacks against Germany to be made by the Royal Air Force. The plan was for anthrax-based biological weapons to be dropped on Germany in 1944. However, the edible cattle cakes and the bomb were not used; the cattle cakes were incinerated in late 1945. Weaponized anthrax was part of the US stockpile prior to 1972, when the United States signed the Biological Weapons Convention. President Nixon ordered the dismantling of US biowarfare programs in 1969 and the destruction of all existing stockpiles of bioweapons. In 1978–79, the Rhodesian government used anthrax against cattle and humans during its campaign against rebels. The Soviet Union created and stored 100 to 200 tons of anthrax spores at Kantubek on Vozrozhdeniya Island. They were abandoned in 1992 and destroyed in 2002. Concentrated anthrax spores were used for bioterrorism in the 2001 anthrax attacks in the United States, delivered by mailing postal letters containing the spores. The letters were sent to several news media offices and two Democratic senators: Tom Daschle of South Dakota and Patrick Leahy of Vermont. As a result, 22 were infected and five died. Only a few grams of material were used in these attacks and in August 2008, the US Department of Justice announced they believed that Bruce Ivins, a senior biodefense researcher employed by the United States government, was responsible. These events also spawned many anthrax hoaxes. Biological hazards, also known as biohazards, refer to biological substances that pose a threat to the health of living organisms, primarily that of humans. This can include samples of a microorganism, virus or toxin that can affect human health. It can also include substances harmful to other animals. Vaccines against the livestock and human disease anthrax—caused by the bacterium Bacillus anthracis—have had a prominent place in the history of medicine, from Pasteur’s pioneering 19th-century work with cattle to the controversial late 20th century use of a modern product to protect American troops against the use of anthrax in biological warfare. Human anthrax vaccines were developed by the Soviet Union in the late 1930s and in the US and UK in the 1950s. The current vaccine approved by the U.S. Food and Drug Administration (FDA) was formulated in the 1960s. Anthrax toxin is a three-protein exotoxin secreted by virulent strains of the bacterium, Bacillus anthracis—the causative agent of anthrax. The toxin was first discovered by Harry Smith in 1954. Anthrax toxin is composed of a cell-binding protein, known as protective antigen (PA), and two enzyme components, called edema factor (EF) and lethal factor (LF). These three protein components act together to impart their physiological effects. Assembled complexes containing the toxin components are endocytosed. In the endosome, the enzymatic components of the toxin translocate into the cytoplasm of a target cell. Once in the cytosol, the enzymatic components of the toxin disrupts various immune cell functions, namely cellular signaling and cell migration. The toxin may even induce cell lysis, as is observed for macrophage cells. Anthrax toxin allows the bacteria to evade the immune system, proliferate, and ultimately kill the host animal. Research on anthrax toxin also provides insight into the generation of macromolecular assemblies, and on protein translocation, pore formation, endocytosis, and other biochemical processes. Building 470 — also called the Pilot Plant, or sometimes “the Tower”, or “Anthrax Tower” — was a seven-story steel and brick building at Fort Detrick in Frederick, Maryland, USA, used in the small-scale production of biological warfare (BW) agents. The building, a Cold War era structure, was transferred from the Department of Defense to the National Cancer Institute-Frederick in 1988, to which it belonged until 2003 when it was demolished. Clostridium tetani is a common soil bacterium and the causative agent of tetanus. When growing in soil, C. tetani are rod-shaped and up to 2.5 micrometres long. However, when forming spores C. tetani becomes substantially enlarged at one end, resembling tennis rackets or drumsticks. C. tetani spores are extremely hardy and can be found globally in soil or in the gastrointestinal tract of animals. If inoculated into a wound, C. tetani can grow and produce a potent toxin, tetanospasmin, which interferes with motor neurons, causing tetanus. All mammals are susceptible to the disease. The toxin's action can be prevented with tetanus toxoid vaccines, which are often administered to children worldwide. The spoilage of meat occurs, if the meat is untreated, in a matter of hours or days and results in the meat becoming unappetizing, poisonous, or infectious. Spoilage is caused by the practically unavoidable infection and subsequent decomposition of meat by bacteria and fungi, which are borne by the animal itself, by the people handling the meat, and by their implements. Meat can be kept edible for a much longer time – though not indefinitely – if proper hygiene is observed during production and processing, and if appropriate food safety, food preservation and food storage procedures are applied. Anthrax vaccine adsorbed (AVA) is the only FDA-licensed human anthrax vaccine in the United States. It is produced under the trade name BioThrax by the Emergent BioDefense Corporation in Lansing, Michigan. The parent company of Emergent BioDefense is Emergent BioSolutions of Rockville, Maryland. It is sometimes called MDPH-PA or MDPH-AVA after the former Michigan Department of Public Health, which formerly was involved in its production. 1 2 3 4 5 6 7 "Symptoms". CDC. 23 July 2014. Archived from the original on 11 May 2016. Retrieved 14 May 2016. 1 2 3 "Basic Information What is anthrax?". CDC. 1 September 2015. Archived from the original on 17 May 2016. Retrieved 14 May 2016. 1 2 3 4 "Who Is at Risk". CDC. 1 September 2015. Archived from the original on 11 May 2016. Retrieved 14 May 2016. 1 2 "Diagnosis". CDC. 1 September 2015. Archived from the original on 11 May 2016. Retrieved 14 May 2016. 1 2 3 4 5 6 7 8 Hendricks, KA; Wright, ME; Shadomy, SV; Bradley, JS; Morrow, MG; Pavia, AT; Rubinstein, E; Holty, JE; Messonnier, NE; Smith, TL; Pesik, N; Treadwell, TA; Bower, WA; Workgroup on Anthrax Clinical, Guidelines (February 2014). "Centers for disease control and prevention expert panel meetings on prevention and treatment of anthrax in adults". Emerging Infectious Diseases. 20 (2). doi:10.3201/eid2002.130687. PMC 3901462 . PMID 24447897. 1 2 "Treatment". CDC. 14 January 2016. Archived from the original on 11 May 2016. Retrieved 14 May 2016. 1 2 3 4 "Anthrax". FDA. 17 June 2015. Archived from the original on 7 May 2016. Retrieved 14 May 2016. 1 2 3 Anthrax: Global Status. GIDEON Informatics Inc. 2016. p. 12. ISBN 9781498808613. Archived from the original on 10 September 2017. ↑ "Types of Anthrax". CDC. 21 July 2014. Archived from the original on 11 May 2016. Retrieved 14 May 2016. 1 2 3 4 "How People Are Infected". CDC. 1 September 2015. Archived from the original on 26 December 2016. Retrieved 14 May 2016. 1 2 3 Turnbull, Peter (2008). Anthrax in humans and animals (PDF) (4 ed.). Geneva, Switzerland: World Health Organization. pp. 20, 36. ISBN 9789241547536. Archived (PDF) from the original on 30 November 2016. ↑ Schlossberg, David (2008). Clinical Infectious Disease. Cambridge University Press. p. 897. ISBN 9781139576659. Archived from the original on 10 September 2017. ↑ "Anthrax". CDC. National Center for Emerging and Zoonotic Infectious Diseases. 26 August 2009. Archived from the original on 26 December 2016. Retrieved 14 May 2016. ↑ "Cutaneous Anthrax". CDC. 21 July 2014. Retrieved 16 February 2018. ↑ "Anthrax Q & A: Signs and Symptoms". Emergency Preparedness and Response. Centers for Disease Control and Prevention. 2003. Archived from the original on 5 April 2007. Retrieved 19 April 2007. 1 2 Bravata, DM; Holty, JE; Liu, H; McDonald, KM; Olshen, RA; Owens, DK (February 2006). "Systematic review: a century of inhalational anthrax cases from 1900 to 2005". Annals of Internal Medicine. 144 (4): 270–80. doi:10.7326/0003-4819-144-4-200602210-00009. PMID 16490913. ↑ "Inhalation Anthrax". The New York Times. Archived from the original on 7 August 2017. Retrieved 14 July 2017. ↑ Kyriacou, DN; Yarnold, PR; Stein, AC; Schmitt, BP; Soltysik, RC; Nelson, RR; Frerichs, RR; Noskin, GA; et al. (February 2007). "Discriminating inhalational anthrax from community-acquired pneumonia using chest radiograph findings and a clinical algorithm". Chest. 131 (2): 489–96. CiteSeerX 10.1.1.691.4935 . doi:10.1378/chest.06-1687. PMID 17296652. ↑ "Gastrointestinal Anthrax". Centers for Disease Control and Prevention. 23 August 2013. Archived from the original on 11 February 2015. Retrieved 10 February 2015. ↑ Hongbin Liu; Nicholas H. Bergman; Brendan Thomasan; Shamira Shallom; Alyson Hazen; Joseph Crossno; David A. Rasko; Jacques Ravel; Timothy D. Read; Scott N. Peterson; John Yates III; Philip C. Hanna (1 January 2004). "Formation and Composition of the Bacillus anthracis Endospore". Journal of Bacteriology. 186 (1): 164–178. doi:10.1128/JB.186.1.164-178.2004. PMC 303457 . PMID 14679236. 1 2 3 4 Pimental, RA; Christensen, KA; Krantz, BA; Collier, RJ (September 2004). "Anthrax toxin complexes: heptameric protective antigen can bind lethal factor and edema factor simultaneously". Biochemical and Biophysical Research Communications. 322 (1): 258–62. doi:10.1016/j.bbrc.2004.07.105. PMID 15313199. ↑ "Crossrail work stopped after human bones found on site". London Evening Standard. Archived from the original on 2 May 2014. ↑ Hudson, JA; Daniel, RM; Morgan, HW (2006). "Acidophilic and thermophilic Bacillus strains from geothermally heated antarctic soil". FEMS Microbiology Letters. 60 (3): 279–282. doi:10.1111/j.1574-6968.1989.tb03486.x. ↑ Guillemin, Jeanne (1999). ANTHRAX, the investigation of a Deadly Outbreak. University of California Press. p. 3. ISBN 978-0-520-22917-4. ↑ "Anthrax, Then and Now". MedicineNet.com. Archived from the original on 20 May 2008. Retrieved 13 August 2008. 1 2 "Anthrax". Centers for Disease Control. 26 August 2009. Archived from the original on 26 December 2016. Retrieved 26 December 2016. ↑ "How People Are Infected". Centers for Disease Control. 1 September 2015. Archived from the original on 26 December 2016. Retrieved 26 December 2016. ↑ "Timeline: How the Anthrax Terror Unfolded". National Public Radio. 15 February 2011. Archived from the original on 26 December 2016. Retrieved 26 December 2016. ↑ Mu Gao (27 April 2006). "Molecular Basis for Anthrax Intoxication". University of Illinois at Urbana-Champaign. Archived from the original on 26 December 2016. Retrieved 26 December 2016. ↑ Chvyrkova, I; Zhang, XC; Terzyan, S (August 2007). "Lethal Factor of Anthrax Toxin Binds Monomeric Form of Protective Antigen". Biochemical and Biophysical Research Communications. 360 (3): 690–5. doi:10.1016/j.bbrc.2007.06.124. PMC 1986636 . PMID 17617379. ↑ Levinson, W. (2010). Review of Medical Microbiology and Immunology (11th ed.). ↑ Forbes, B. A. (2002). Bailey & Scott's Diagnostic Microbiology (11th ed.). ↑ National Personal Protective Technology Laboratory Respirators Archived 31 July 2017 at the Wayback Machine . National Institute for Occupational Safety and Health. 30 April 2009. ↑ David V. Cohn (11 February 1996). "Life and Times of Louis Pasteur". School of Dentistry, University of Louisville. Archived from the original on 8 April 2008. Retrieved 13 August 2008. ↑ Mikesell, P.; Ivins, B. E.; Ristroph, J. D.; Vodkin, M. H.; Dreier, T. M.; Leppla, S. H. (1983). "Plasmids, Pasteur, and Anthrax" (PDF). ASM News. 49: 320–2. Archived (PDF) from the original on 8 August 2017. Retrieved 8 June 2017. ↑ "Robert Koch (1843–1910)". About.com. Archived from the original on 5 July 2008. Retrieved 13 August 2008. ↑ Splino M, et al. (2005), "Anthrax vaccines" Archived 2 January 2016 at the Wayback Machine , Annals of Saudi Medicine ; 2005 Mar–Apr;25(2):143–9. ↑ "11 December 2008 Approval Letter". Food and Drug Administration. Archived from the original on 29 June 2017. Retrieved 8 June 2017. 1 2 Esther Schrader (23 December 2003). "Military to Halt Anthrax Shots". Los Angeles Times. Archived from the original on 26 December 2016. Retrieved 26 December 2016. ↑ "How should I decontaminate during response actions?". Occupational Safety & Health Administration. Archived from the original on 26 December 2016. Retrieved 26 December 2016. ↑ "CDC Anthrax Q & A: Treatment". Archived from the original on 5 May 2011. Retrieved 4 April 2011. ↑ "HGSI asks for FDA approval of anthrax drug ABthrax". Forbes. Associated Press. 21 May 2009. Archived from the original on 18 October 2014. ↑ "FDA approves raxibacumab to treat inhalational anthrax". Archived from the original on 17 December 2012. Retrieved 14 December 2012. ↑ News Release (21 March 2016). "FDA approves new treatment for inhalation anthrax". FDA. ↑ Suffin, S. C.; Carnes, W. H.; Kaufmann, A. F. (September 1978). "Inhalation anthrax in a home craftsman". Human Pathology. 9 (5): 594–7. doi:10.1016/S0046-8177(78)80140-3. PMID 101438. ↑ Sarah Schweitzer (4 January 2010). "Drummer's anthrax case spurs a public health hunt". The Boston Globe. Archived from the original on 14 December 2013. Retrieved 19 October 2014. ↑ "PROMED: Anthrax, Human – USA: (New Hampshire) 26 December 2009". Promedmail.org. Archived from the original on 27 September 2011. Retrieved 17 March 2014. ↑ "PROMED: Anthrax, Human – USA: (New Hampshire) 18 April 2010". Promedmail.org. Archived from the original on 27 September 2011. Retrieved 17 March 2014. ↑ "Man who breathed in anthrax dies". BBC News. 2 November 2008. Archived from the original on 7 March 2016. ↑ "An Outbreak of Anthrax Among Drug Users in Scotland, December 2009 to December 2010. A report on behalf of the National Anthrax Outbreak Control Team" (PDF). HPS. December 2011. Archived from the original (PDF) on 20 October 2013. Retrieved 14 December 2013. ↑ McNeil Jr, Donald G. (12 January 2010). "Anthrax: In Scotland, Six Heroin Users Die of Anthrax Poisoning". The New York Times. Archived from the original on 2 January 2016. ↑ ἄνθραξ . Liddell, Henry George ; Scott, Robert ; A Greek–English Lexicon at the Perseus Project. ↑ Harper, Douglas. "anthrax". Online Etymology Dictionary . ↑ Breniquet, Catherine; Michel, Cécile (31 July 2014). Wool Economy in the Ancient Near East. Oxbow Books. ISBN 9781782976349. Archived from the original on 27 August 2016 – via Google Books. ↑ de Trevisa, John (1398). Bartholomaeus Anglicus' De Proprietatibus Rerum. ↑ Stark, James (2013). The Making of Modern Anthrax, 1875–1920: Uniting Local, National and Global Histories of Disease. London: Pickering & Chatto. ↑ Madigan, M.; Martinko, J., eds. (2005). Brock Biology of Microorganisms (11th ed.). Prentice Hall. ISBN 978-0-13-144329-7. ↑ M, J (22 September 1906). "John Henry Bell, M.D., M.R.C.S". British Medical Journal. 2 (2386): 735–6. doi:10.1136/bmj.2.2386.735. PMC 2382239 . ↑ "Industrial Infection by Anthrax". British Medical Journal. 2 (2759): 1338. 15 November 1913. PMC 2346352 . ↑ Jones, Susan (2010). Death in a Small Package: A Short History of Anthrax. Baltimore: Johns Hopkins University Press. ↑ Decker, Janet (2003). Deadly Diseases and Epidemics, Anthrax. Chelesa House Publishers. pp. 27–28. ISBN 978-0-7910-7302-5. ↑ Geison, Gerald (2014). The Private Science of Louis Pasteur. Princeton University Press. ↑ Stark, James (2012). "Anthrax and Australia in a Global Context: The International Exchange of Theories and Practices with Britain and France, c.1850–1920". Health and History. 14 (2): 1–25. doi:10.5401/healthhist.14.2.0001. ↑ Willman, David (2007), "Selling the Threat of Bioterrorism", The Los Angeles Times , 1 July 2007. ↑ Jacobsen, Annie (2015), The Pentagon's Brain: An Uncensored History of DARPA, America's Top Secret Military Research Agency; New York: Little, Brown and Company, pg 293. ↑ Scott Shane (23 December 2001). "Army harvested victims' blood to boost anthrax". Boston Sun. UCLA Dept. of Epidemiology site. Archived from the original on 29 December 2009. Retrieved 6 August 2009. ↑ "Sandia decon formulation, best known as an anthrax killer, takes on household mold". 26 April 2007. Archived from the original on 5 September 2008. Retrieved 13 August 2008. ↑ "The Anthrax Cleanup of Capitol Hill." Documentary by Xin Wang produced by the EPA Alumni Association. Video, Transcript (see p8). May 12, 2015. ↑ "Remediating Indoor and Outdoor Environments". Archived from the original on 13 October 2013. Retrieved 10 October 2013. ↑ "Using Bleach to Destroy Anthrax and Other Microbes". Society for Applied Microbiology. Archived from the original on 17 May 2008. Retrieved 13 August 2008. ↑ Vipin K. Rastogi; Shawn P. Ryan; Lalena Wallace; Lisa S. Smith; Saumil S. Shah; G. Blair Martin (19 March 2010). "Systematic Evaluation of the Efficacy of Chlorine Dioxide in Decontamination of Building Interior Surfaces Contaminated with Anthrax Spores". Applied and Environmental Microbiology. 76 (10): 3343–3351. doi:10.1128/AEM.02668-09. PMC 2869126 . PMID 20305025. 1 2 "Pesticide Disposal Goes Green". Science News. Archived from the original on 29 June 2011. Retrieved 8 June 2009. ↑ "The Anthrax Cleanup of Capitol Hill." Documentary by Xin Wang produced by the EPA Alumni Association. Video, Transcript (see p3). May 12, 2015. ↑ William J. Broad (1 March 2002). "Anthrax Expert Faces Fine for Burning Infected Carcasses". The New York Times. Archived from the original on 26 December 2016. Retrieved 26 December 2016. ↑ "Britain's 'Anthrax Island'". BBC News. 25 July 2001. Archived from the original on 26 December 2016. Retrieved 26 December 2016. ↑ Bisher, Jamie, "During World War I, Terrorists Schemed to Use Anthrax in the Cause of Finnish Independence", Military History, August 2003, pp. 17–22. Anthrax Sabotage in Finland. Archived 25 October 2009. ↑ Cole, Leonard A. (1990). Clouds of Secrecy: The Army's Germ Warfare Tests Over Populated Areas. Rowman and Littlefield. ISBN 978-0-8226-3001-2. Archived from the original on 22 January 2010. ↑ Robertson, David. "Saddam's germ war plot is traced back to one Oxford cow". The Times. Archived from the original on 25 December 2005. ↑ "UK planned to wipe out Germany with anthrax". Sunday Herald. Glasgow. 14 October 2001. ↑ Croddy, Eric; Wirtz, James J. (2005). Weapons of mass destruction: an encyclopedia of worldwide policy, technology, and history. ABC-CLIO. p. 21. ISBN 978-1-85109-490-5. Archived from the original on 22 February 2017. ↑ David Martin (16 November 2001). "Traditional Medical Practitioners Seek International Recognition". Southern African News Features. Archived from the original on 11 May 2013. Retrieved 19 October 2014. 1 2 Guillemin, Jeanne (1999). ANTHRAX, the investigation of a Deadly Outbreak. University of California Press. pp. 275–7. ISBN 978-0-520-22917-4. ↑ "Plague war: The 1979 anthrax leak". Frontline. PBS. Archived from the original on 17 September 2008. Retrieved 13 August 2008. ↑ Michael C. Fishbein. "Anthrax – From Russia with Love". Infectious Diseases: Causes, Types, Prevention, Treatment and Facts. MedicineNet.com. Archived from the original on 24 October 2008. Retrieved 13 August 2008. 1 2 Alibek, K. (1999). Biohazard. New York: Delta Publishing. ISBN 978-0-385-33496-9. 1 2 Meselson, M.; Guillemin, J.; Hugh-Jones, M.; Langmuir, A.; Popova, I.; Shelokov, A.; Yampolskaya, O.; et al. (1994). "The Sverdlovsk anthrax outbreak of 1979". Science. 266 (5188): 1202–1208. doi:10.1126/science.7973702. PMID 7973702. ↑ Sternbach, G. (2002). "The History of Anthrax". Journal of Emergency Medicine. 24 (4): 463–467. doi:10.1016/S0736-4679(03)00079-9. PMID 12745053. ↑ Josh Barney (17 October 2012). "U.Va. Researchers Find Anthrax Can Grow and Reproduce in Soil". U. Va. Health System. University of Virginia site. Archived from the original on 21 October 2012. Retrieved 1 October 2013. ↑ "Anthrax as a biological weapon". BBC News. 10 October 2001. Archived from the original on 5 May 2016. Retrieved 16 April 2016. ↑ Cole, Leonard A. (2009). The Anthrax Letters: A Bioterrorism Expert Investigates the Attacks That Shocked America—Case Closed?. SkyhorsePublishing. ISBN 978-1-60239-715-6. Archived from the original on 3 February 2011. ↑ Bohn, Kevin (6 August 2008). 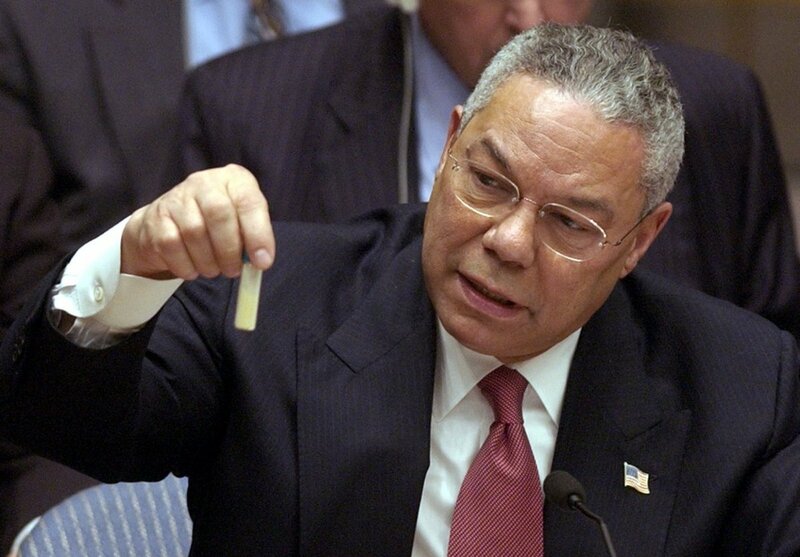 "U.S. officials declare researcher is anthrax killer". CNN. Archived from the original on 8 August 2008. Retrieved 7 August 2008. ↑ "Cepheid, Northrop Grumman Enter into Agreement for the Purchase of Anthrax Test Cartridges". Security Products. 16 August 2007. Archived from the original on 16 July 2011. Retrieved 26 March 2009. ↑ "USPS BDS FAQ" (PDF). ↑ "Latest Facts Update". USPS. 12 February 2002. Archived from the original on 9 May 2009. Retrieved 13 August 2008. ↑ "Seventeen-year-old devises anthrax deactivator". NBC News. 23 February 2006. Archived from the original on 7 October 2014. ↑ "Amplification". Criminal Minds . Season 4. Episode 24. 13 May 2009. CBS. ↑ "Can Dogs Get Anthrax? Archived 6 April 2012 at the Wayback Machine " Canine Nation, 30 October 2001. Retrieved 17 February 2007. ↑ Dragon, D. C.; Elkin, B. T.; Nishi, J. S.; Ellsworth, T. R. (August 1999). "A review of anthrax in Canada and implications for research on the disease in northern bison". Journal of Applied Microbiology. 87 (2): 208–213. doi:10.1046/j.1365-2672.1999.00872.x. ↑ Revich, Boris A.; Podolnaya, Marina A. (2011). "Thawing of permafrost may disturb historic cattle burial grounds in East Siberia". Global Health Action. 4: 8482. doi:10.3402/gha.v4i0.8482. ISSN 1654-9880. PMC 3222928 . PMID 22114567. ↑ "40 now hospitalised after anthrax outbreak in Yamal, more than half are children". Archived from the original on 30 July 2016. ↑ Luhn, Alec (8 August 2016). "Siberian Child Dies After Climate Change Thaws an Anthrax-Infected Reindeer". Wired. Archived from the original on 17 August 2016. Retrieved 19 August 2016. Wikimedia Commons has media related to Anthrax (disease) .